Interior house painting in Brandon FL 33511 completed the week of 10-10-2013. 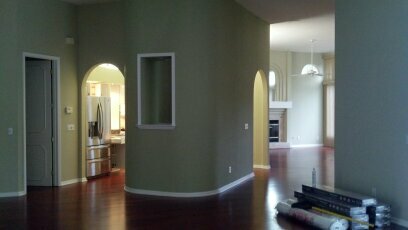 This home had all of the ceilings, walls, trim and doors painted with Sherwin Williams coatings. The first area of the home to be painted was the baseboards and trim work. Many areas of the baseboards required sanding and caulking on this project. If the prep work is not done. the baseboards will not look seamless and clean when painted. You will notice nail holes and all of the joints. Once we had the trim work done, our painters moved out to the garage where all of the doors are waiting to be painted. 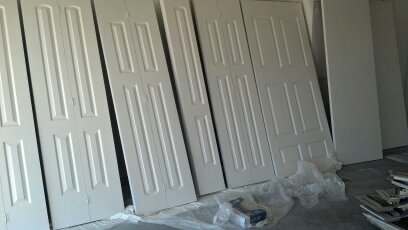 Our Brandon house painters remove all of the door hardware prior to spraying. Two coats of premium quality semi-gloss bring the doors back to a nice clean shine. This home required the ceilings to be painted. All areas of the house must be prepared for the over spray and silica dust. Our Brandon house painters cover the entire room with paper and plastic. All of the trim work that was sprayed is covered with one inch tape and paper. 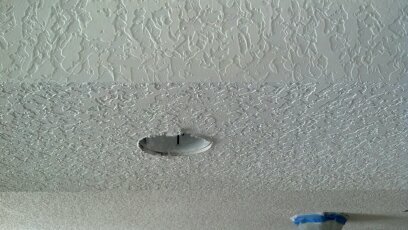 All of the ceilings are sprayed at the same time, including the garage and the closets. The interior walls are last to receive coating. The top cut in line along the ceiling is cut and then rolled down with a four inch roller. Finally the walls are rolled and all tape and paper is pulled when the paint is wet. This ensures clean razor sharp lines along the trim work and ceiling areas. This entire house painting Brandon project took our crew three days to complete. All color codes including touch up paints are left with the homeowners. Contact Peerless for a free house painting estimate today.